I have just received my tiny little one ml bottle of spring rose oil in the mail. I just paid $24.95 for it. It is so tiny, how could it possibly be worth that much money? But then, I take off the lid and inhale and am transported to a rose garden, in an exotic, Asian location. As I inhale I imagine that there are petals falling onto the ground, as lush ripe roses reach their peak. The scent is all around me, undeniable, floral and enveloping. Apparently, there are 70 rose blossoms for each of the 20 drops of oil I have in my bottle. This is a virtual garden. but a portal to memories and places. But this oil isn’t only beautiful – (if roses are your thing), a few drops of this oil in a face cream helps turn it into a regenerating balm. A drop on my shoulder before making love may bring up my husband’s sperm motility and increase the odds of having a baby if this is my desire. If I get a cold sore and catch it in the itchy stage a drop of rose oil will often stop its growth. Customers are great learners. There is so much to explore about each item, that the curious are often drawn. 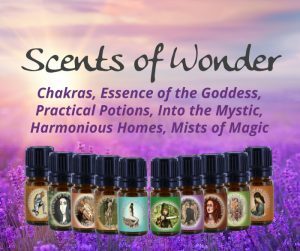 One customer used to frequent our store and let her young child smell essential oils, since she was about two, by the time she was six she could identify dozens of smells, while her peers knew only the fruits. A neighbor fell off her bike and lost a lot of skin and was badly cut on her face and hands. She used a scar blend – and healed within a few weeks without scars. A client who burned herself rather badly did what we suggested during class and applied lavender oil to the burn. The pain subsided almost immediately and the burn healed quickly. A student’s mother was experiencing dizziness, headaches, and irritability when she used commercial household cleaners. After taking the class her daughter showed her how to use eucalyptus oil mixed with water in a spray bottle to wipe off germs and lemon or peppermint oil and vinegar to sparkle glass. Her symptoms went away and she felt happier about cleaning her house. A student applied peppermint oil neat onto her tummy while experiencing cramps from her menstrual cycle. The oil felt a little strong but decreased her cramps within minutes.